SGM Carbon Dioxide Incubator are designed to provide ideal tissue culturing conditions with high resistance to contamination. It gives control over contamination with simplicity of operation and reliable performance. It is useful for photosynthesis and other biological experiments in laboratory. These are aesthetically designed. SGM CO2 Incubators are used in biological experiments to allow growth of organisms in optimal conditions of temperature, carbon dioxide and humidity. Incubators are generally supplied in one of three configurations, air jacket, dry wall and water jacket. 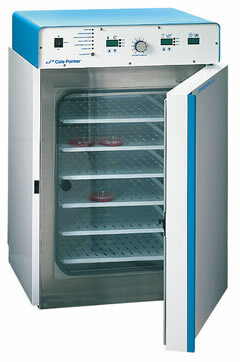 Air draft incubators are popular among larger-volume models designed to allow for quicker recovery times. Air draft (or forced draft) incubators circulate air throughout the interior of the incubator to maintain constant temperatures. Dry wall incubators have the advantage that they can better adapt to ambient changes and require less maintenance. Water-jacketed incubators advantages include stable temperature control and increased security in the event of power failure (due to water's natural insulation abilities). Most versatile for Biochemical Oxygen Demand determinations. Castor wheel mounted cabinet is double walled with inner chamber of Stainless steel sheet of grade SS 304 and outer wall of heavy gauge PCRC steel. sheet duly degreased and pre treated with primers for rust proofing duly painted with attractive stove enamel or powder coated. The temperature inside the CO2 incubator is controlled by intelligent programmable temperature controller and indicator. This controller is based on the microcontroller nano watt technology and its ergonomic design suits for any specific requirement of the CO2 Incubator like Datalogger facility, Thermal and DOT Matrix interface, direct dataload facility in computer office automation software like MS-Word and Excel and many other features listed in the specification bellow. Carbon Dioxide can be provided inside the chamber through an inlet nozzle provided on the cabinet through a CO2 cylinder. The gas flow can be regulated by using flow control valve with CO2 regulator. Air can be admitted through nozzle fixed on the cabinet. Flowmeter to check the flow of CO2 and air compressor for air flow can also be supplied (optional). Accurate Infrared CO2 Control System The SGM Carbon Di Oxide Incubator Incubator uses a microprocessor based, non-dispersive infrared CO2 sensor. The amount of energy diffused to the detector is an exact logarithmic function of the CO2 concentration in the gas between source and detector. The wavelengths used are absorbed by a filter in the CO2 bandwidth making the measurements insensitive to other components, such as water vapor. Advanced design provides a very stable drift-free output requiring less frequent calibration. The sensor is within the chamber air plenum so very accurate CO2 control is achieved. SIZE(W x D x H) CAP. APPROX. CAP.